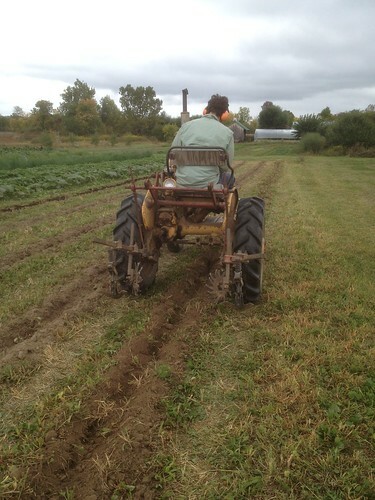 Favorable Furrows at North Slope Farm..
An ecological focus directs us to be conscious of Life around us. As a Farmer, you learn about the irony of constantly battling nature, to yield a profitable crop…To read more about Todd Haldeman’s experience with Favorable Furrows – Click Here. Discussion, Observation and Investigation has popularized the awareness of Vital and Dynamic Soil Biota, Life, Ecology. As Farmers, we are stimulated by the Concept that to Disturb Soil, is to Destroy Life and Ecology.. This is Not a New Awareness.. but, like more people, than ever, now have an awareness of Organic (Agricultural Management) Practices.. Our communities are quickly adopting the awareness that Soil is Alive – and that Life has profound and unique Purpose(s)! No-Till and Minimal Tillage Techniques, are concepts, that refer to, reducing the mechanical disruption of Soil Ecology, such that the Living Soil, can Maximize its Potential. The Details of these techniques relate to specific Farmers, Farms and Resources. Foster Multi Species Cover Cropped Farmland..
Plant, or utilize shallow cultivation techniques to maintain “stale seedbed”, until Planting. applied to achieve these goals and potential improvements for the future. blocks. These were seeded with a mix of winter legumes and grasses. A potential improvement to this method of whole field tillage would be pasture cropping. Colin Seis’s operation near Sydney, Australia has developed this operation which integrates perennial crop mixes with intensive rotational grazing. This method requires several years between vegetable crops. However, between vegetable crops pastured ruminants and grain crops are harvested. Attempts to reduce tillage heading into winter included broadcasting cover crop mix on production blocks cleaned of debris from previous flower and tomato crops. Compost applied via compost spreader covered the seeds. Germination was good in these trials and the cover crop stand was relatively free of unwanted plants. In November, garlic was planted in the furrows which previously grew tomatoes. Through this method, one round of soil preparation served two crops. The garlic bulbs were covered with 6”+ of straw. A modification of this approach would be to intercrop with several species of clover to feed the crop and provide ample shade for the soil surface during spring. In March, a mix of roots and peas were planted in raised beds. As the previous winter crops were harvested, bare soil was left. With brief hand weeding the beds were prepped and seeded without tillage and a robust crop of sugar snap peas was reaped by early May. Maintaining constant soil cover on beds being harvested in late fall can be difficult as conditions do not favor planting cover crop. To prevent winter erosion, I would personally suggest experimenting with some form of mulching. 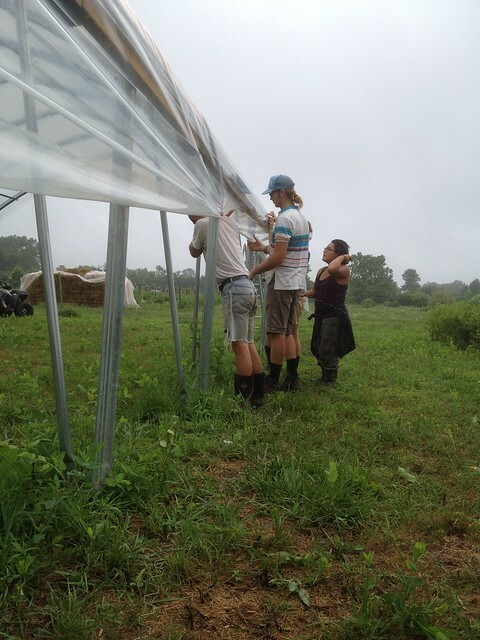 We experimented with sheet mulching this year to decent success. This included layers of manure (green or ruminant), sheets of cardboard, a very shallow layer of compost to breakdown the carbon rich mulch, and wood chips. When inoculated with King Strophoria (Garden Giant) mushroom spawn, a good yield of fungus can be harvested in spring and fall. A simpler method would be covering production areas with leaves and layers of old hay toprevent leaves from blowing away. As the annual rains reduced our ability to do tractor work in the majority of the operation, preparing raised beds for mid April planting relied heavily on tillage to breakdown mature cover crop residue. Planting into thicker residue was the result. 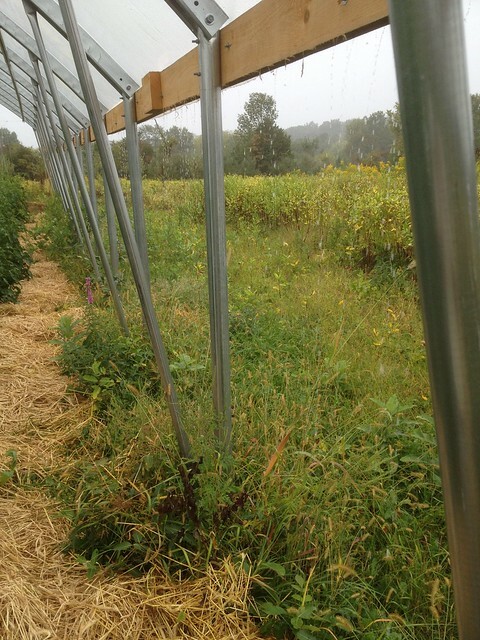 An improvement to our practices would be to plant raised beds with winter kill cover crops. Incorporating winter kill legumes, oats and other green manures may allow for reduction or elimination of fertilizer input. I am personally a big fan of broad forking as a means of ensuring soil aeration. However, it does take a significant amount of time and energy. During May, the decomposing residue retained moisture despite a lack of rain and it was clear that the crops were very healthy. As day temperatures began to exceed 85 degrees, we experimented with solarization; using “waste” pieces of greenhouse plastic. Beds were mowed and solarized, effectively killing all residue. We would then till the residue and plant. A modification of this technique to prevent tillage would be inserting transplants directly into the crop residue. In experimental plots we tried inserting transplants directly into solarized soils aerated with the action of the broad fork. This worked well. Direct seeding is more difficult as the hand seeders are unable to breakthrough residue. BCS attachments capable of crimping residue, cutting residue, and jab planting seeds would make direct seeding into solarized or crimped cover crop easier for small scale operations. As the season progressed, the solarization technique was useful for rapidly turning over crop residue, but the rear tine tiller was still employed for every preparation. Our typical method of field bed preparation included ripping a 12” deep furrow with the IH 140, compost and fertilizer application, followed by several rounds of tillage with the Case 265 – 36” tiller attachment and/or 18” BCS rear tine tiller attachment. Modifications to these practices would be the implementation of a rotary power harrow for both walk behind and tractor attachment. The rotary power harrow horizontally mixes the soil surface without pulling unwanted seeds up from deeper depths. For late germinating crops (beets and carrots), a flame weeder was applied about 5-7 days after seeding. Occulation with an opaque fabric after tillage encourages germination of weeds, especially when soil moisture is scarce. It would also be interesting to determine if occulation after tillage prevents carbon dioxide from leaching into the atmosphere. Compost is traditionally covered to prevent nutrient release into the atmosphere so the same principle should apply… in theory. Although the techniques listed above to reduce tillage were fairly effective, the application on a large scale is difficult to envision without the use of tractor implements or grazing ruminants. The key line plow has been developed for deep soil aeration and can/has been combined with a seed drill, fertilizer applicator and compost tea applicator to jumpstart soil health on degraded and compacted land. Seeding a diverse crop including grasses, legumes, mustards, brassicas, roots, chenopods, herbs and dynamic accumulators would be beneficial for feeding soil, especially if combined with intensive rotational grazing techniques. I was interested in experimenting with intercropping in the beginning of the season as a means of providing constant soil cover to reduce evaporation of soil moisture. Our cover cropping techniques included hand broadcasting a cocktail of buckwheat, vetch, peas, clover and wheat after tillage of pathways. This typically occurred when the next production block was maturing. In this fashion, we could mow the flowering cover crop after harvesting had ceased. Another method for cropping pathways was simply spreading clover seed before mowing. This technique allowed mineral rich plants such as plantain, burdock, dandelion and chicory to act as a nurse crop for the legume seed. Intercropping using polycultures seems to be an effective means of maximizing space. I have personally been experimenting with the meso-american polyculture of corn, beans and squash for 5 years. Traditionally these milpa systems produced a wide variety of plants in addition to the three sisters (ie. sweet potatoes, chiles, tomatillos, melons, flowers, leafy greens, herbs, small grains, young trees etc). Complementary architectures of both foliage and roots, allows for satisfactory distribution of nutrients, moisture and light. The diversity of root exudates further enhances soil biology. Granted it would be very inefficient for a farm paying people to stumble through a corn jungle to harvest melons, but complex polycultures should be common place in cover crops. Over the course of the year, I realized that my goal in pursuing a career in regenerative agriculture was to develop a holistic understanding of the watershed services of farmland and to find the most effective strategies for protecting our living waters. Rain water infiltration, percolation and purification through topsoil formation should be one of the primary goals for all farmers. The improved health of terrestrial and aquatic ecosystems, better food and water quality, the growth of economic assets (topsoil and water) and an effective strategy for fighting climate change/desertification are a few of the benefits of building soil. Learning the on ground application of retaining rain water in soils was a major motivator for myself in hindsight. In this essay I will discuss the importance of eliminating tillage, building soil organic matter and maintaining soil cover as it relates to the health of watersheds. Ray Archuleta’s (NRCS-South Carolina) soil slake test shows clearly that soil aggregates are key to providing a resilient soil structure. Soil pores, whose structure is held via organic “glues” (ie. glomalin) and via the structure of fungal hyphae, are key to soil health (Sylvia et al., 2005). These pores slowly percolate water, creating a favorable microclimate for soil microorganisms, which are key players in nutrient cycling. Tillage eliminates the porous structure of the soil and therefor infiltration. Soil organic matter (SOM) is oxidized through tillage and therefor released into the atmosphere as greenhouse gases at various concentrations relative to different tillage operations (Al-Kaisi and Yin, 2005). Because soil organic matter absorbs moisture like a sponge, up to 20 times its weight in water, eliminating tillage improves the water and nutrient uptake efficiency of plants (Johnson et al., 2005). The water retention capability of SOM plays a crucial role in the health of our watersheds. Percolation allows for a prolonged release of freshwater into our creeks, streams and estuaries without the deposition of sediment, which all too often results in eutrophication and marine dead zones; a huge problem for marine ecology (ie: the Gulf of Mexico). Gabe Brown of North Dakota has seen a 250-300% increase in soil organic matter, a 16 fold increase in water infiltration (1/2”/hr to 6”/hr) and 90% reduction in fertilizer application using no-till and intensive rotational grazing techniques (extension.psu.edu, 2014). Using very diverse cover crop mixes, as proven by Dr.Ademir Calegari, the Brown’s crop and rangeland remain constantly covered. With constant cover the temperature of the soil never gets so high as to affect soil microbiology or evaporation/transpiration rates of the crops (Chavez NRCS 2010). Another piece of research to mention in regards to the prevention of eutrophication is STRIPS (Science-Based Trials of Row-crops Integrated with Prairie Strips). STRIPS can have a major impact in reducing erosion and nutrient leaching. STRIPS researchers concluded that if 10% of a production field was converted to native prairie strips nitrogen loss was reduced by 80%, phosphorous by 90% and sediment loss by 95% (5,000 lbs of soil/acre) (Dell-Harro, 2015). The benefits of having living roots in the soil and carbon covering it are numerous. In the end, I hope this essay expresses the holistic value of living soils as they relate to our crop land, watersheds and marine waters. Al-Kaisi and Yin. 2005. Tillage and crop residue effects on soil carbon and carbon dioxide emission in corn-soybean rotations. Journal of Environmental Quality. Dell-Haro. 2015. The Benefits of Native Prairie Strips. Mother Earth News. April-May edition. Johnson et al. 2005. Greenhouse gas contributions and mitigation potential of agriculture in the central USA. Soil and Tillage Research, pp. 73-94. Sylvia et al. 2005. Principles and Applications of Soil Microbiology, 2nd Edition. Prentice Hall. When taking responsibility for an element focus this year, several considerations were taken into account. The size and experience of the next year’s crew, the priority of said element to the farm, the time of season the element takes precedent and the personal appeal of each element were a few. In the end, the element of planting was chosen. The main motivations are; to influence a strong start to next season, to prepare for planting throughout the season with attentiveness, the personal appeal of seeds and their stories, and last and most important, to promote the philosophy of earth care in one of the most integral elements of farm existence. If the farm is a machine, the seeds are the sparkplug. The importance of seeing seedlings push out each new stage of growth is vital for a beginning and/or experienced crew. Ensuring these seedlings have strong roots by planting time provides crop security. The early spring months are when the pace of the farm season is set and having a smooth transition from startup to planting seemed to be a logical area to focus my attention. Appealing to the 6 P’s of success (proper preparation prevents piss poor performance), I surmised that planting would be the one element which invariably leads to some measure of success with proper preparation. In winter, said planning manifests itself in the form of next season’s seed order. Determining the amount of seed for each crop was done by examining the previous year’s planting records. With this information, I compiled the total foot of row to be planted in each crop, the amount of seed required (direct seeding requires more seed than transplanting) and the approximate time at which planting is to occur. During the season, land must be prepped weeks ahead of planting. It was my observation that the manager often had too many things on the farm plate to be prepared for each planting date (based upon moon cycles). As an element focus, I will actively advocate for crew hours and attempt to adhere to planting schedules as much as possible. Innately, the ethno-botanical significance of plants and their seeds appeals to me. Considering the dubious nature of our current food systems, it is more important than ever for people to reconnect to food. In my opinion, nothing prevents over-consumption and waste more effectively than having an intimate relationship with the plants, fungi and animals that sustain us. As farmers, we provide clean, local food which inherently reduces the consumers’ ecological footprint, but most importantly, we provide a story which instills a sense of reverence for the foodstuffs consumed. As a grower, I enjoy the story of the seeds whose domestication can be traced tens of thousands of years and often holds a profound cultural importance beyond which our consumer culture can understand. As I stated previously, the philosophy of earth care was a major consideration in deciding to manage planting. In the one year I have been exposed to diversified organic farming, I have observed the importance of soil ecology. In my opinion the success of annuals and perennials (and our planet) is merely a derivative of the health of the soil. Cover crops provide numerous benefits to ecology; provide pollen for insects, sequester several tons of carbon dioxide per acre, reduce water requirements of annuals and perennials when inter-cropped successfully, and provide fertilizer in biomass thereby building a healthier soil so plants don’t require fertilizers, pesticides and herbicides which currently pollute rivers and estuaries. In an industry which uses ungodly amounts of freshwater, fuel, fertilizer, chemicals and plastic, surely cover crops are to be of enormous importance in the future of agriculture and horticulture. A holistic understanding of inter-cropping cover crops will be garnered through the season and a balance between regenerating nature and harvesting a yield will hopefully arise. There are so many words that come to mind when I think of North Slope Farm: stewardship, respect, growth, camaraderie, family, and home. 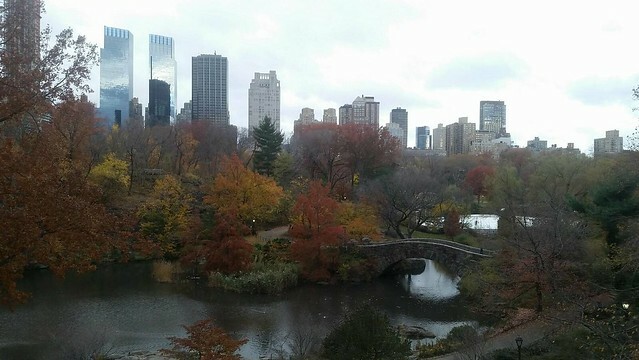 North Slope was all that to me for two and a half years until I left in my third year to finish some schooling efforts and to eventually take a position working in Central Park, New York City. Currently, I am the 59th Street Pond Zone Gardener working for the Central Park Conservancy (http://www.centralparknyc.org). My section, the southeast corner of the park, is the entry point for millions of park patrons each year. My job description is vast and challenging and involves performing all the horticultural maintenance in the landscape including the lawns, annual, perennial and shrub beds surrounding this water body. Much of what I’m able to get accomplished today at my current position is a credit to the time I spent at North Slope Farm’s Apprenticeship program. In hindsight, I owe a debt of gratitude to Mike and his willingness to share his knowledge, experiences, and training to create in me a foundational knowledge of both horticulture and mechanics. From the largest trees to the smallest noxious weeds (galinsoga everywhere!) to the largest pieces of equipment (landscaping mowers) to the smallest pieces of equipment (my trusty pruning shears), I confidently know I have the knowledge and skills to maintain this landscape and use these tools efficiently. I examine intently, make conscious choices with the future of the pond’s landscape in mind, and take time to properly sharpen my hori hori. This is not the traditional season summary, and as my title suggests it is a reflection on the value of training and the respect an apprentice has for his trainer. I would not have been hired by the Central Park Conservancy if it hadn’t been for the opportunities given to me by North Slope Farm. As I sit and type, my gratitude for this farm, and the people that gravitate toward it, are at an all time high. To North Slope Farm, I thank you. To Mike, Colleen, Casey, Summer, Todd, Dan, Christine, Sam — thank you for constant encouragement and willingness to build a community so deeply rooted in all the things that are right in this world. I gratefully tip my chewed up ball cap to you all. 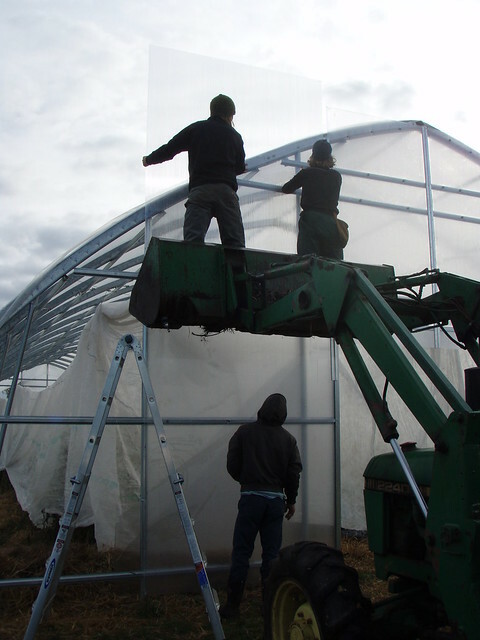 At the core of early spring production at North Slope Farm is the greenhouse element. 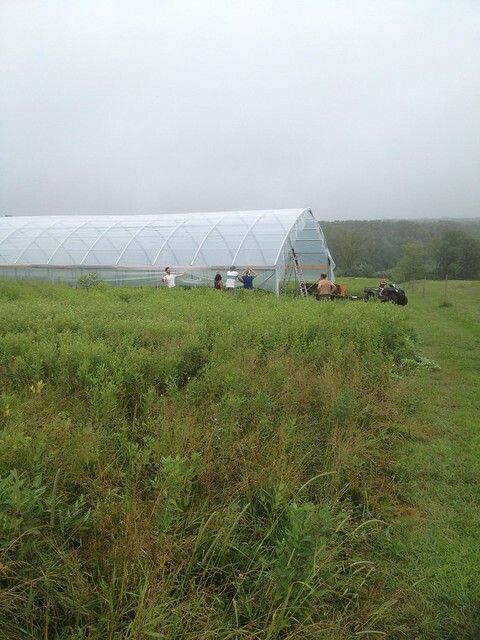 The jumping off location for the season, the heated greenhouse where we start all of our seedlings for on-farm successions, wholesale account sales, and retail seedling sales for all three markets. 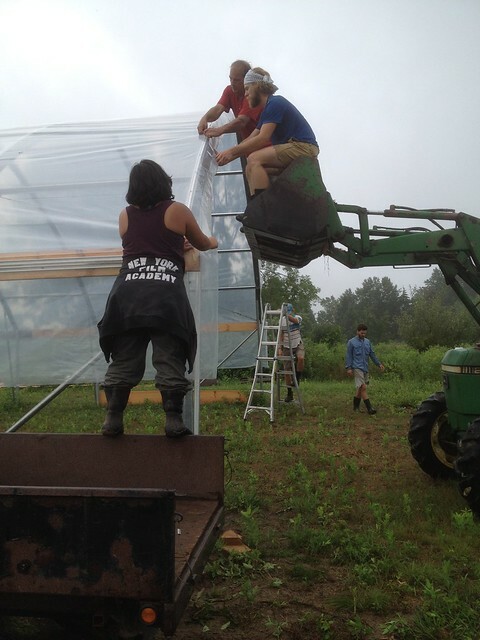 On cold, wet days, the greenhouse allows the crew to congregate in a warm, dry location to complete tasks. On seeding days, we see our work grow exponentially as table after table become filled with harbingers of summer. The heated greenhouse is a special place. 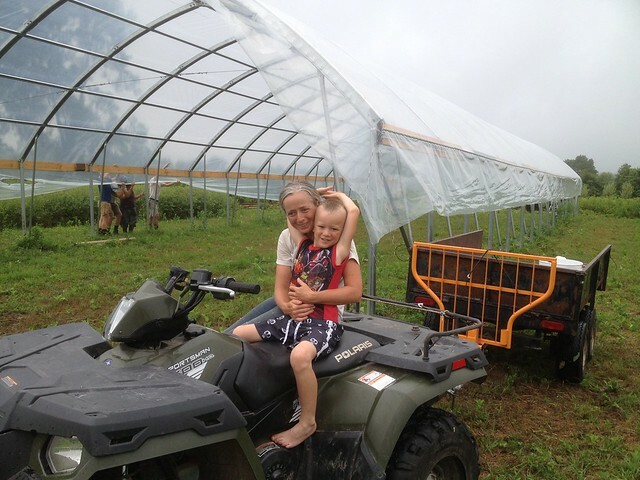 And for all of those reasons and more, I’ve chosen to focus my third year on the Greenhouse element North Slope Farm. To implement the greenhouse order forms, maintain a healthy environment for seedlings, communicate effectively with farm and planting manager regarding the status of seedlings, and to have a good time doing it. All in all, I’m looking forward to focusing my energies on the greenhouse element. It will be a big wave of work upfront then to tail off as the weather agrees with direct seeding. Here’s to a great 2016 season. Click on the Photo above, to enter the Flickr Photosharing website. 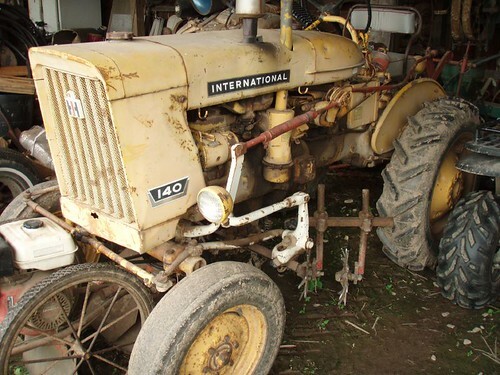 This photo is one of the Album; “Equipment,” that can be selected, to quickly review our Tractors and Misc Equipment! Crop care is at the core of everything we do at North Slope Farm. Once a crop is in the ground, it falls under the jurisdiction of the “crop care manager,” thus all perennials and annuals need attention, care, and time devoted to ensure we’ve created an environment that promotes plant health and vigor. After deliberating over a few different elements, I choose crop care as my focus for the 2015 season for multiple reasons: it’s importance to the farm operation, how it was overlooked at times during the 2014 season (only due to not having someone dedicated to this element), an opportunity to be an advocate for the crops, and ultimately to gain an intimate understanding of how best to efficiently manage the crops in conjunction with worker hours. Crop Care is intuitively important to the day-to-day farm operation. Intuitively, when you put a living organism into the ground, it needs attention and care for it to thrive. When weed pressure exists, it’s obvious to pull those weeds that inhibit growth of the crop. When drought conditions arise, you must get water to your crops to allow them to grow. Less subtle reasons exist also: making sure crops are protected from pests, covering crops with fabrics to prevent frost damage during colder months, preparing beds in a manner to minimize the need for costly (time and money) hand labor, and accumulating the materials needed to make all of these endeavors a success. 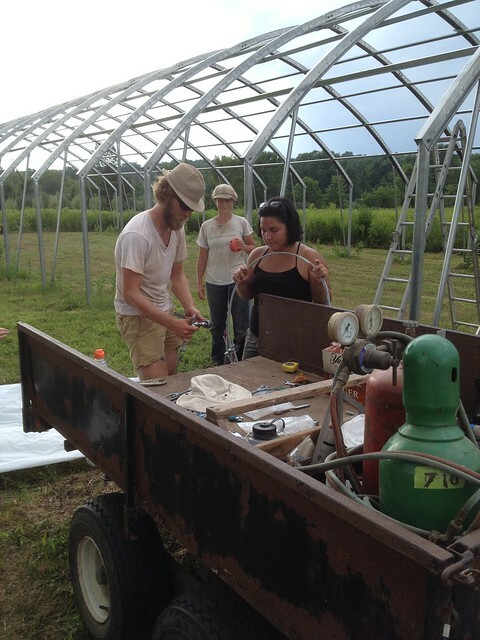 2014 was my first introduction to farming on a market-level scale. At the end of the day, the season was a success and my time learning and growing at North Slope was beyond measurement. Though, being my first year, it was an introduction. With that perspective in mind, and when I critically reflected on the season, it occurred to me that our crops were, at times, overlooked. Simply put: without somebody’s direct focus on Crop Care, the element was laid on the shoulders of the Farm Manager – someone who has the entire farm and all of the core elements on the front and back of his mind at all times. To measure success, I must first define success within the context of a North Slope apprenticeship. For myself and the farm operation, I would define a season’s success as a season that continues to fulfill our markets full of local organic produce and great learning and growth. With that definition in mind, I’d call this season a success. We maintained our status quo by fulfilling markets with our core crops, but we also tested (and brought back) some techniques that helped suppress weeds, retain precious soil fertility (I think), and also brought a valuable product to our community that promotes vitality, both ecologically and socially. Monitoring rainfall and the moisture levels of our production fields was a constant activity throughout the season. Early in the season, we set moisture level gauges in the ground, and, at the beginning of each week, I would take a field walk to measure the ground water saturation. If the ground was saturated, we’d let it be and wait to irrigate. If the gauge read dry, we knew it was in need of irrigation. In the beginning of the season, this proved to be a helpful tool to wrap one’s mind around the specific soil conditions here at NSF and how to recognize moisture levels better. As the season progressed, I stopped using the gauges for two reasons: work piled upon work and we were constantly occupied with other tasks besides moving gauges to new production fields and rainfall became less frequent and an established irrigation rotation was set in place. That being said, the gauges are effective. If you needed a more concrete way of determining if a crop needs irrigation, these gauges give quick, accurate readings. We went through two major drought periods this season. The first coming early from the end of April all the way up until the first week in June. The second dry spell was more typical and ran from the end of July through the beginning of September. There were a couple < ½” rains during this stretch, but it was never enough to spell the drought and saturate the hot, dry ground. Mechanical cultivation meant driving in a plume of dust. When you’d scrape your boot across the furrowed fields, you’d kick up fine particles of dust into the air. It was dry. And, naturally, the drought occurred during peak season with multiple fields in production, Farmhouse Gothic loaded with tomatoes, HT1 packed with flowers, Ralph’s House full of delicate strawberries, the corner garden full of onions, and some pesky strawberries/prolific peppers/eggplants/peppers and flowers in plastic out at the 579. Looking back through the irrigation and rainfall log over both of these long drought periods, there wasn’t a minute during the work week (and sometimes weekends and nights) where irrigation was not flowing. This meant devising a plan. At first, the plan was written on paper. As the season progressed and our harvests became more rhythmic, I simply handled the irrigation first thing in the morning and right after lunch. I’d try to get two blocks on each day for five hours each. In the past, we’d typically irrigate for four hours, but because the ground was so dry, we found it took five hours to get full irrigation coverage – especially the furrows. Staying organized and devising a plan, whether on paper or mentally, for the week was absolutely necessary in order to stay on top of the constant activity. Using the weed whacker, aggressively scalping the ends of the BGB beds (point where the sub main and lines attach) is well worth the extra time and effort. If you are managing crop care and taking off lines, reattaching lines, moving lines, it makes your job much, much easier. Dealing with irrigation can be irritating at times, and it only intensifies when there is constant debris in the way. Always load up your irrigation bucket with essentials: hex driver, end caps, extra valves, 1” male x male connects, hose clamps, and at least one extra 1” female quick connects. And if you pick up a piece that is broken, don’t leave it in the bucket. Toss it. Carry a good belt tool. I used my belt tool more times than I could count. Broken valve? Belt tool. Need to make a cut in the line? Belt tool. Valve stuck in the sub main and can’t get the leverage to pull it out? Belt tool. Fencing is an important topic to consider as deer are as abundant in this area of New Jersey as any other place in the country. We use a welded poly wire electrical fence that, in most places, stands approximately 6’ tall. 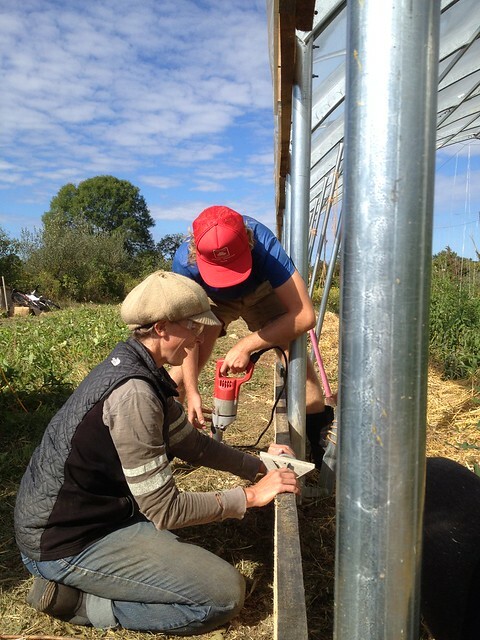 Early in the season, we had to make some simple repairs to the market garden fence (Veg A, B, and C). Some lines had fallen in the winter. Some posts came loose from the heave ho of winter ground. TH and JT pulled the ATV with a trailer full of fine gravel around to all the posts. If the post was loose by hand, we’d pull it out, add in some gravel, reset the post, one of us would stand on the ATV for leverage and pound the post into the ground with a sledgehammer while the other would brace the post. Finally, we’d add more gravel around the base and tamp it firm into the ground. About a month later, during my first market garden mow, I hit the NW corner post with the Ferris roll bar and knocked it out of the ground. After a few shoddy repairs, the fence line held in place, though odds are it will need to be touched up again after the ground freezes and thaws a few times. Corner posts are a topic to consider here. 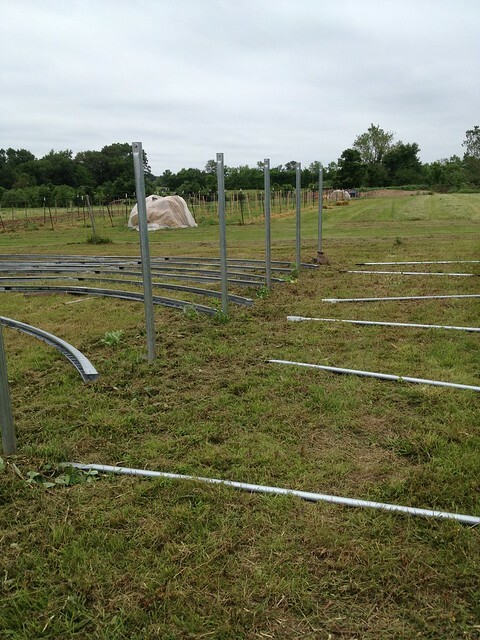 The corner posts are subject to some serious tension, therefore they must be braced and supported properly otherwise the post will fall over from the pull of the electrical wired fence line. Speaking of corner posts, there were a couple involved repairs in CSE field. We replaced the NW & SW corner posts with new posts and restrung the electrical fence wire. We also completely repaired the CSE gate as it was in disarray at the start of the season. All signs point to repairing the north east gate on the market garden fence line for 2016. Farming takes an initial influx of capital to purchase materials necessary to make the farm go. At North Slope, we need new supply of drip tape, drip tube, 1” sub-mains, fittings, valves, gauges, woven ground cloth. Looking back on what we purchased and what we have left in stock, I feel confident that we bought just the right amount of everything we needed. Salad Mix, when done efficiently, is a very fruitful enterprise. The limiting factor here is weed control. The amount of time our crew spends hand weeding is critical. For instance, I project that NSF can increase our profit up to $3,500 by utilizing a two week stale seed bed and flame weeding and/or covering our stale seed bedded BGBs with black woven fabric combination. For the last two months of the season, we’ve employed these techniques with success except for one succession. Because we missed our stale seed bed and flame weed window, we spent 16 hours of hand labor to save each bed. This shows how critical it is to be one step ahead of your planting dates. When you can knock back the initial flush of weeds and seed directly into a clean bed without stirring up other weed seeds, you are going to see an immense difference. Without flame weeding or covering the beds with woven fabric, we are looking at a minimum of 8 hours and up to 16 hours of hand weeding. If we eliminate those hours, we can save anywhere from $80 to $160 per bed. Because we cut from 22 beds of lettuce, over the course of the season those numbers translate into a savings of $1,760 and upwards of $3,520. Nothing here is ground breaking technology, though sometimes numbers speak louder than words. In order to shore up more time for other NSF projects, to limit the amount of time hand weeding, and to save a substantial amount of money, every BGB should be stale seed bedded and flame weeded before seeding. Our BGBs are carrot growing machines. Early in the season, before we got our flame weeder operational, our first line of defense after germination was the scuffle hoe. Scuffle hoeing does a great job attacking the weeds in-between our rows, but the limiting factor is how close you can get to the crop without destroying it. No matter how close you get, you’ll still end up with a significant amount of hand weeding to knock back weeds and create a habitat fit for adolescent carrot growth. Herein lies the beauty of the flame weeder. Carrots are slow germinating crops, days slower than the weed seed bank that lives within the friendly confines of our BGBs. Our method to weed control in the BGBs is to prep the beds, wait until the first of the weed seeds start to germinate, then flame weed them. If it’s in a dry time of year, we will irrigate the beds to promote weed growth, then once weed seeds germinate, we flame them. It’s quick and incredibly effective way of weed management without disturbing the soil which promotes more weed growth. For a second year, NSF utilized a minimal-till method of growing our crops in a manner we’ve coined “Favorable Furrows” where instead of plowing the entire field then bed forming, we simply rip a total of 14-16 furrows with a single shank and plant directly into them. This method provides a series of unique challenges to crop care management. We took to lightly tilling (top 2-3” of soil) up to the edge of our crops. This knocked back germinated weeds and kept the pathways under control. It’s effective, but the general feel is we’re still trying to hone the most effect troupe of weed management strategies for the furrows. We grew our field tomatoes in favorable furrows once again. Trellised with metal and wood stakes (in succession like this: M w w M w w M w w M, etc. 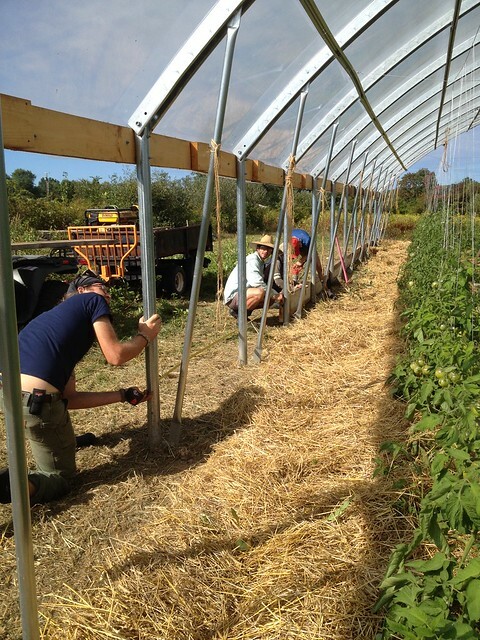 ), we string tomato twine along each side to keep the plants upright. Instead of pruning the majority of suckers, we clipped up the vines on the existing trellis. We laid a heavy application of mulch on the southern two or three beds, but to save us time, we choose not to do so for the remaining tomato beds. On the macro scale, it seemed this did not affect our crop production. As a crew, we went into the tomato field one time for a serious afternoon of hand weeding, but beyond that, time managing the tomato crop weed pressure was minimal. By mid-summer, we had flea beetle, Japanese beetle, leaf miner, and cabbage worm problems on our young leafy greens. After stripping the infected leaves without the results we had hoped, we decided to spray OMRI approved Entrust SC. With a 3 gallon backpack, we added the appropriate ratio of Entrust and added fish emulsion into the mix as a foliar fertilizer. The spraying was always done early in the morning with NSF crew member wearing the appropriate safety gear. After spraying, the results were extreme, as the population of pests were knocked back and our crops were saved. I could write on and on about the 2015 Crop Care season focus, as it played a significant part in almost every facet of the day-to-day operations at North Slope Farm. Focusing on Crop Care allows one to immerse oneself in the intimate rhythms of tending crops, soils hydration and fertility, insect hatchings, and on and on. 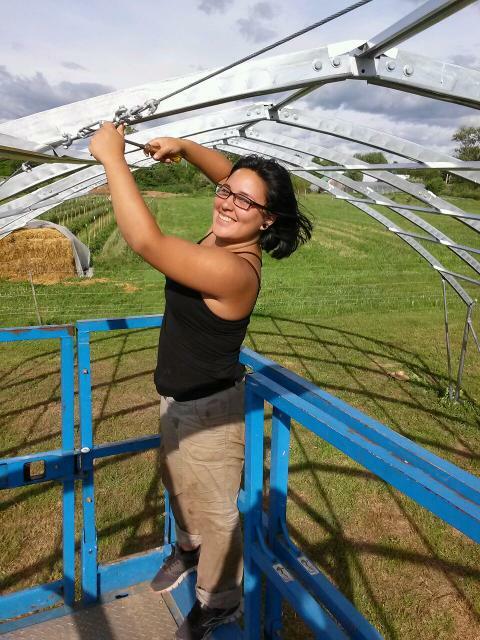 For me personally, the experience was rich with autonomy and gave me the space to test my fledgling understanding of the state of small scale agriculture in New Jersey. 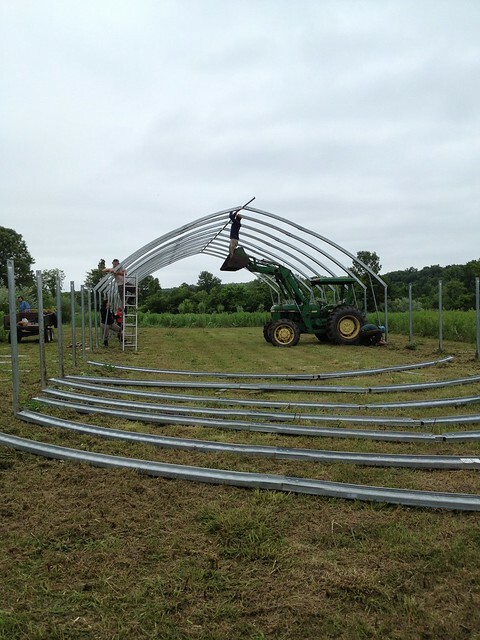 In the 2014 season, NSF purchased two 30’x100’ high tunnels to expand production and season longevity. 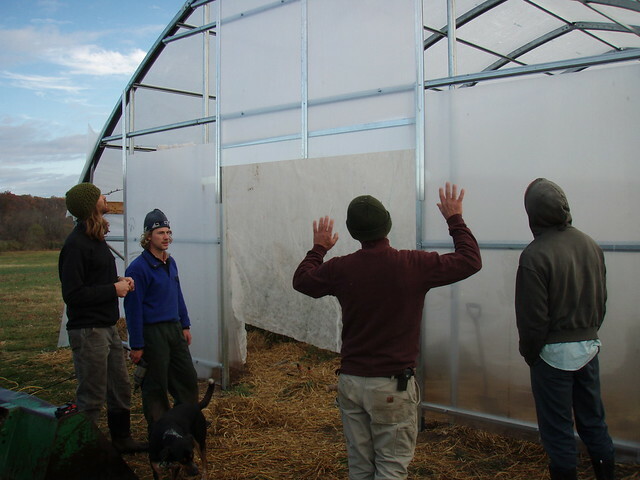 In this summary, I’m going to lay out our construction methods, talk in layman’s terms about the construction phases, and look into the true cost of the high tunnel including the equipment rentals, labor, and materials. Looking back at the notes, it was evident that the construction was broken down into six phases. Throughout this summary, I’ll delve into each specific phase in more detail to both provide a record NSF can share with others and for my own learning reinforcement as I oversee the construction of HT1’s twin, HT2. The first phase of the HT1 involved what any build calls for: site and design. Siting HT1 was done by MR using his understanding of NSF land contours, solar access, and accessibility to irrigation. 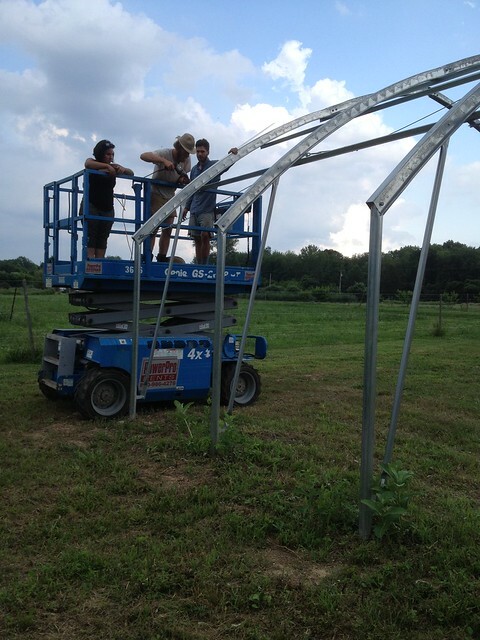 After the general location was decided upon, the crew set out to confirm the dimensions of the greenhouse using the 3:4:5 triangle method. This method is as such: any triangle whose sides are in the ratio of 3:4:5 is a right triangle. To properly use this method of measurement, we measured from our first corner post along one edge 3 feet. We marked that measurement. Again from the corner post, we measured along the adjacent edge 4 feet. Finally we measured diagonally across. If the measurement was 5 ft then the triangle is a 3:4:5 right triangle and the corner is ultimately square. We repeated this step for all four corners. Next, we strung the batter boards 3 feet from the construction to maintain permanent line attachments where we could continually confirm, square, and level our measurements. It was critical to have accurate measurements early on as the rest of construction was supported by these measurements. Here at North Slope Farm, we deal with a subsurface sheet of shale that is impenetrable by hand. 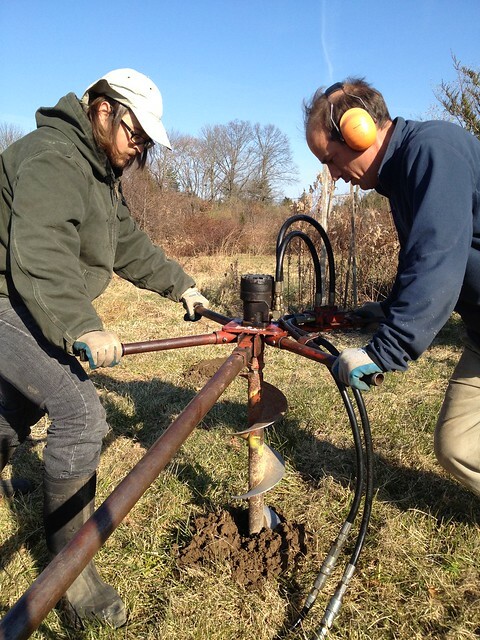 In order to excavate the 34 total ground post holes, we first rented a hand hydrologic auger as seen in the picture below. 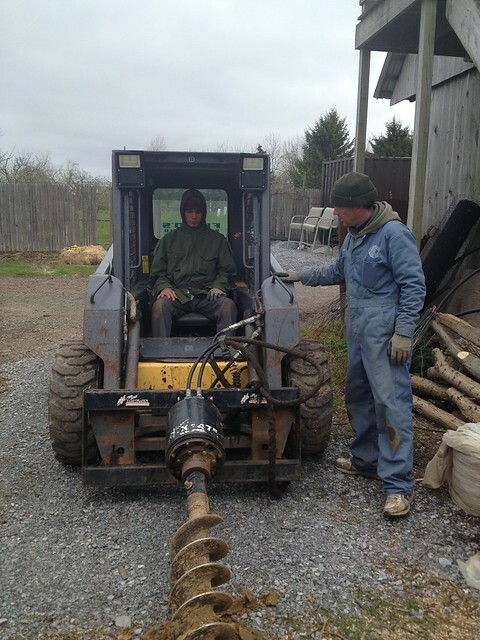 The auger pictured above simply lacked the power to dig out the holes efficiently, so we eventually rented a skid steer with an hydrologic auger attachment and aimed to dig the holes to 3’. Most holes were dug to three feet, but a few holes hit bedrock before the three foot mark. We lived with the results and moved on. After the holes were dug, we filled the base of the holes with concrete and set the ground posts. To make sure each post was plumb, level, and the correct height, we confirmed each of those variables with two East to West string lines and used a level to assure posts were plumb. Once all variables were in check, we added a bit more concrete then back filled the holes with soil. After setting the 34 posts, the next step is to mount the rafters to the posts. Before we could mount the rafters, we had to first construct them on the ground. All rafter assemblies consisted of four rafter sections joined by a single chevron at the peak. Once we put together the rafters on the ground, we then moved on to attach them to the posts with the help of the John Deere bucket. Mounting a rafter. Note MR adjusting tension of the chevron at ridge. After lifting a rafter up to the corresponding posts, we aligned the mounting holes and attached the rafter to the post with a bolt into each mounting hole. This is being demonstrated by AM and RM in the photo below. AM and RM placing bolt to fasten rafter to post. Raising rafters, attaching ridge purlin, and loosely attaching rafter struts. To attach the rafter struts, we took a strut and loosely attached it to the ground post flange using the 5/16” fasteners provided. Once loosely attached, we pulled the rafter strut up into position to be aligned with the rafter hole and corresponding hole on the strut. We inserted the bolt through the rafter hole and through the mounting hole on the strut, added a locknut and tightened to secure the strut to the rafter. We would do the same on the opposite side of the high tunnel. 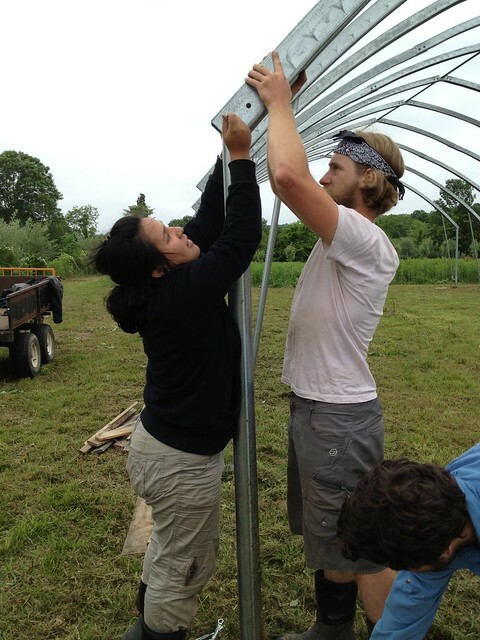 It is important to attach the struts before you begin to attach all the purlins. They don’t have to be fully tightened, but having them attached is crucial. 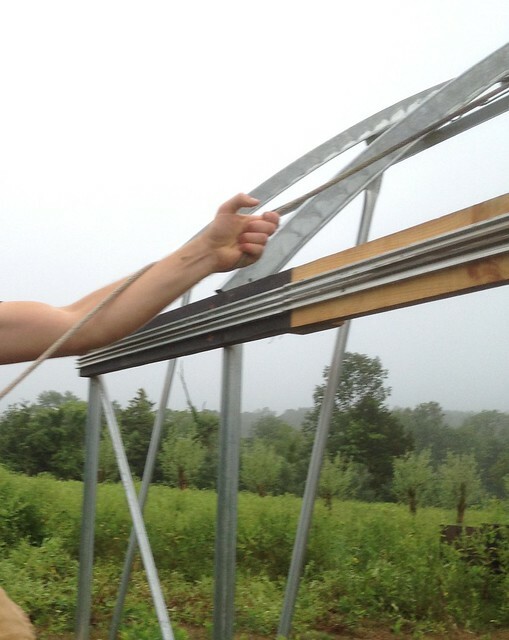 In the photo below, AM demonstrating how to loosely attach a rafter strut to the post flange. With the first three rafters assembled, we began to mount the first under purlin and secured it to the rafters using the ¼” x 1” bots and nuts. 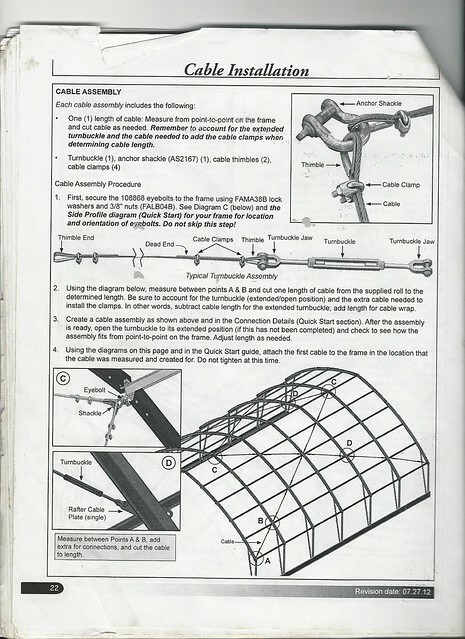 At some points, a purlin and a rafter are used to attach cable assemblies. To do that, we installed the rafter cable plate between the rafter and under purlin. The first step to attaching the cable is to attach the eyebolts to the frame. Next we measured the distance between points A and B and cut one length of cable from the roll to the determined length. It is imperative to account for the turnbuckle and the extra cable needed to install the clamps. After doing that, we created the turnbuckle assembly. To create the turnbuckle assembly, we used the diagram on pg 22 of the instruction manual(see photo below). The assembly uses a combination of thimbled ends, cable clamps, turnbuckle and turnbuckle jaws to create a tensioning cable that ties each rafter to one another to create a seemingly hurricane-proof design. Below, you can see we used the back of a trailer attached to an ATV as our turnbuckle assembly workbench. This works great as the work bench is mobile and moves along with the crew as needed. Building the Turnbuckle assembly on mobile workbench. To attach the turnbuckle assembly, open the turnbuckle to its extended position and check to see how it fits from point to point on the frame. From the diagrams on page 22 (here’s a link to the PDF of the instructions) of the instruction booklet, we attached the first cable to the frame in the location the cable was measured and created for. In the first photo below, JT and TH demonstrate how we used the scissor lift to attach cables to the frame. We repeated this step on all the cables. Finally, when all the cables were attached, we tightened the turnbuckles. It’s important to not over tighten the turnbuckles as you can pull the posts out of plumb. In the photo below, AM is demonstrating how we used a long screwdriver to turn the turnbuckle to tighten it down. AM tightening turnbuckles with long screwdriver for leverage to turn the buckle. To attach the diagonal struts for additional support, we used a vise grip to bend each flattened end of the strut to have the ends of the struts flat against the frame when installed. We positioned the diagonal strut in between the end rafter and the interior rafter with the strut bent end nearer to the rafter on the end rafter and the other end near the bottom of the post on the interior rafter post. Think “diagonal” strut if that sounds confusing! We mounted the struts by drilling holes then inserting bolts with washers through the mounting holes. Before moving forward from here, we made sure all frame members were properly secured, that all bolts and screws were tight, and to cover up any sharp edges or fasteners, we cut 12” pieces of repair tape and taped the tops of all interior rafters to protect the plastic. We also cut 4” strips of tape and taped over each rafter splice. To install the Poly Latch U-Channel on the end ridge, from the peak, we attached u-channel to top of rafter every 12”. We made sure to cut the last section flush to the bottom end of the rafter. To attach the ribbon board to the base of the rafters, we used 5/16”x5” carriage bolts. We had to countersink the bolts because the ribbon board we used was thick (a bit wider than 2”). We installed all the carriage bolts then tightened them at the end. We used self-tapping screws and carriage bolts to attach the double poly latch u-channel. 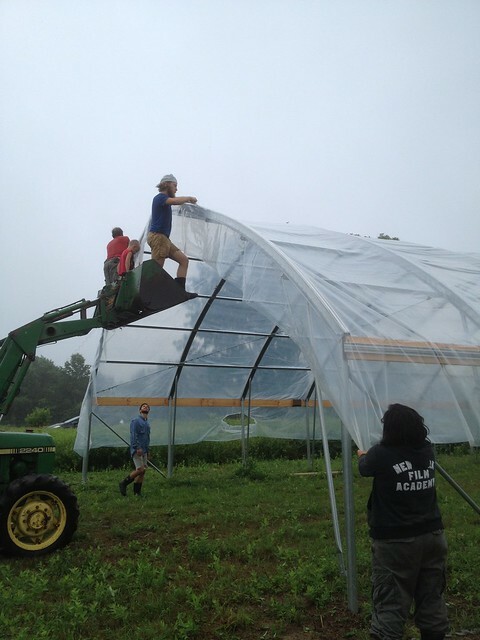 We woke early in the middle of the season with all hands on deck to get the plastic over the frame. We started out by tying ropes to one end of the plastic and throwing the ropes over the HT until we stood on the other side with the rope over the ridge of the HT and attached to the plastic on the ground. All we had to do was pull together, right? Wrong. Heave, ho! We gave it our all, but it proved too heavy and difficult! We stood confounded, MR running up and down the HT trying to push the plastic up into the air with a broom or piece of wood. In the end, we started to flap the plastic up and down – creating the “billowing” effect – which allowed the air to get under the plastic and there it came over the ridge and down to the other side. Success! We secured the plastic on the ridge first. We used the JD bucket to access the peak of the HT. From the peak of West end, we wiggle wired to lock the plastic into the channel. Next we secured the opposite end. One person wiggled while the other tried to hold the plastic taut to create tension. Thirdly, we locked in one long side with wiggle wire to create tension for the opposite long side. On the opposite side, JT, TH, AM, and RM worked together: two persons held the plastic taut while one applied the wiggle wire and the other one drove our mobile scaffold (the ATV and trailer). We then cut the excess plastic. To attach the baseboards, we established the layout, trimmed the boards to length, drilled holes, and then used u-bolts to attach the boards to the posts. To date, we have yet to set up the roll-up sides. CH with a big smile! Setting baseboards is fun! 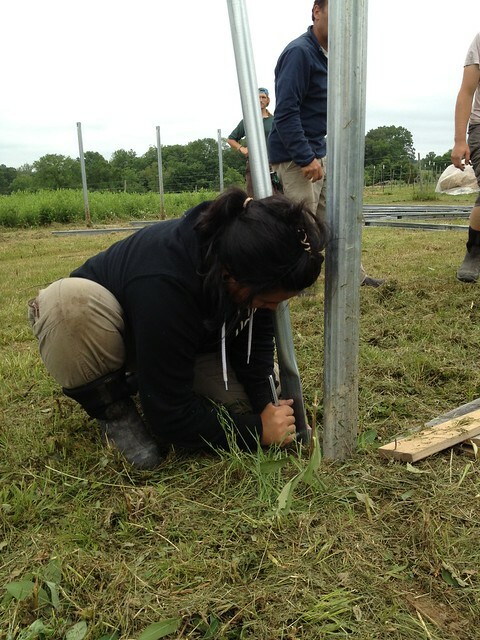 To build the endwalls, we started by measuring out the holes for upright posts. Once measured out, we dug the holes, added concrete then set the posts to plumb and level. We backfilled the holes with more concrete and soil we dug up from the holes. Then we set the horizontal cross bracing. 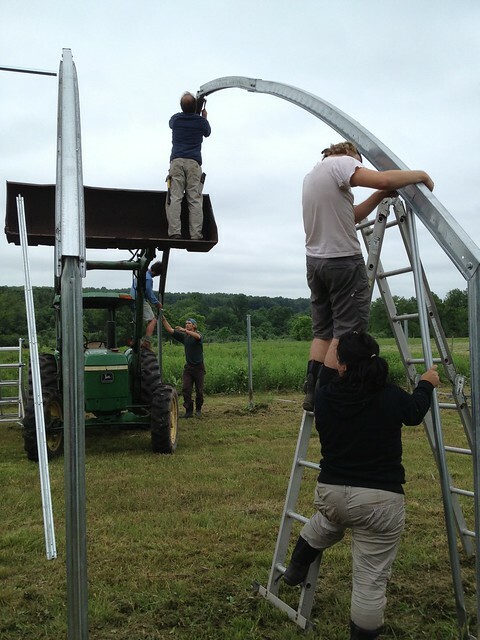 After the cross bracing, we started to attach the polycarbonate paneling. Master carpenter, and friend of the farm, Ric Stang oversaw JT, RM, and TH as we cut and pieced the paneling together. We had to open the H-channel with the hammer on some of the pieces as the paneling had to enter the h-channel from both the top and the side. We also tried a soap mixture to create some lubrication. Paneling was set by self tapping screws and washers. We had to cut the excess paneling around the end walls to fit it flush to the frame. We used a box cutter to lightly score the polycarbonate, then repeated the light scoring until the poly could be bent. After it folded back, we would be able to bend it back and forth until the piece we wanted cut came off. This was very effective. In hopes of determining the true cost of purchasing and constructing HT #1, we’ve gone back to the receipts and notes to add up the numbers. 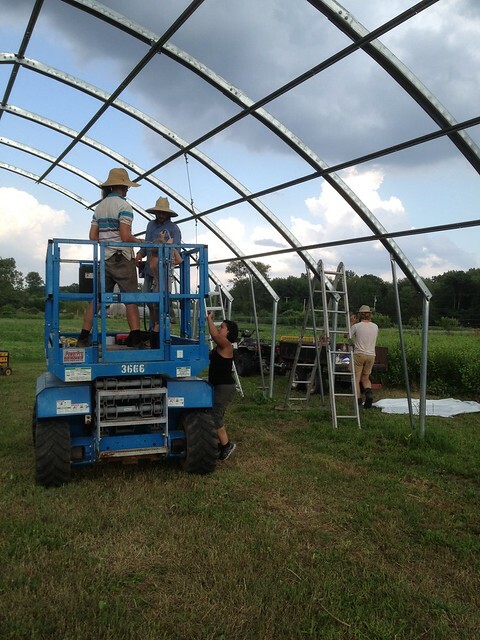 At first glance, the high tunnel materials (frame & endwalls) were 75% of the total cost. Equipment rentals tallied 8% of the total cost, worker wages was in at 8%, and additional materials cost 8%. Overall, the numbers below tell us that the true cost, albeit high, is justified with the majority of the capital spent on physical infrastructure, equipment necessary to complete tasks (efficiently and safely) and worker hours. To see it through as a profitable investment, we will have to continue to record data regarding the harvests recorded in HT1.